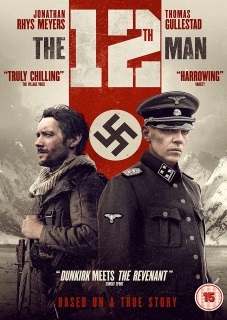 THE 12TH MAN is a breath-taking war thriller about an incredible true-life story of heroism and a man's unbreakable will to live. Norway, 1943: after a failed anti-Nazi sabotage mission leaves his eleven comrades dead, Norwegian resistance fighter Jan Baalsrud (Thomas Gullestad) finds himself on the run from the Gestapo through the snowbound Arctic reaches of Scandinavia led by Kurt Stage (Jonathan Rhys Meyers). It's a harrowing journey across unforgiving, frozen wilderness that will stretch on for months - and force Jan to take extreme action in order to survive. The legendary story of Jan Baalsrud s escape remains one of the wildest, most unfathomable survival stories of World War II. A very fine, true story Norwegian WWII drama about an escaped prisoner of war and the subsequent hunt for him by the Germans comes to DVD from Signature Entertainment. I also got their DVD release for Final Score (2018) at the same time and a lot of what I had to say there was applicable here as well. Both are very new productions shot on digital equipment (confirmed on Final Score, suspected on 12th Man). The 12th Man utilises and much more natural colour grade through much of it's length with pure whites and rich deep blacks. There were some sequences that displayed a bias that reminded me of the orange and teal fad of a decade or so ago but on the whole that wasn't the case. We have a fairly standard high definition transfer of a brand new film that was most likely shot digitally. You know the score; an ever so slightly muted colour effect when compared to film with high contrast, plenty of fine detail and deep black levels ... when seen in full HD. This DVD is obviously a major downgrade by comparison, but is still a decent product. The film makers have given this a decent, look and the transfer appeared very pleasing for the format on my 58" 4K display. Black levels were satisfying and there didn't appear to be much unintended crush. Contrast was decent and detail did manage to break through the fog of standard definition quite pleasingly. I did notice the odd moment of posterisation in some of the darker scenes when I got up close to the image (say a foot or two off the display) but it wasn't noticeable from a normal viewing distance (in my case ten feet). I'll also point out that my display is correctly set up using a professional setup disc which tends to ensure that decent basic transfers - like we have here - look good in either SD or HD. I have all artificial "picture enhancements" switched off; essential. There was some noise in the image but again I find that's fairly standard for DVD. This is a single layered DVD. Lively, lossy Dolby Digital down-mixes of state of the art modern soundtracks which is to say my 5.1 system got a real workout with plenty of active surround and LFE with the subwoofer engaged frequently. I heard little by way of distortion but being lossy the track was muted by comparison to lossless and required the volume to be higher than normal. The 2.0 was obviously less robust with weaker fine detail but was still decent enough. Subtitles are obviously essential for all who don't speak Norwegian but are sadly burnt in and can't be removed. A major demerit for Norwegian speakers. An entertaining piece of thickear gets a solid standard def transfer on a single layered DVD of a modern digitally shot production. Sound is equally decent but but extras are barely worth the term. A shame because the Norwegian Blu-ray release has some contextual material not ported over here which appears brief and superficial but it would've been better than nowt.